We are lucky to have the lovely Wood Thrush, with its ethereal song, in Glen Providence Park! It is a “species of conservation concern” due to a 56% drop in population since the 1960’s, largely because of forest fragmentation and acid rain. The International Wood Thrush Conservation Alliance is being formed to study ways to protect the Wood Thrush along with other birds and wildlife. What did famed ornithologist John James Audubon miss while traveling in Europe in the 1800’s? 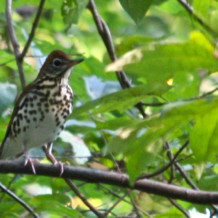 He was homesick for “the sweet melodious strains of that lovely recluse, my greatest favorite, the Wood Thrush.” There are many more quotes out there- I won’t list them all! You can listen to a sample of its song here, but it is best appreciated in the woods, with all its variation, repetition, and ethereal beauty. Listen for it the next time you visit Glen Providence Park!